New York-headquartered global media giant News Corp. has acquired Mumbai-based FinDirect Services Pvt Ltd, the company behind BigDecisions.com, a personal financial planning portal. The transaction details are not disclosed. Following the acquisition, co-founders Manish Shah and Gaurav Roy will help oversee the expansion of BigDecisions.com's team as well as its consumer offerings in India. They will report to Raju Narisetti, senior vice president (strategy) at News Corp. The deal follows News Corp.'s acquisition of 25 per cent stake in PropTiger.com, a real estate marketing platform, for $30 million in November this year. 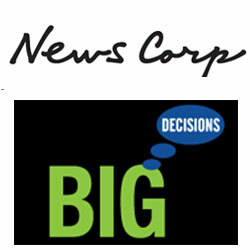 "Our latest investment builds on our abiding belief that a digital India needs more trusted, reliable and independent data," said Robert Thomson, CEO of News Corp. "BigDecisions.com will help Indians make the most important decisions by using accurate information tailored to their personal needs. This platform will be high quality, privacy-protected and easy-to-use." BigDecisions was launched in early 2013 by Shah and Roy. An alumnus of IIM Ahmedabad, Shah spent a decade with Citigroup in India and the US in the unsecured lending, wealth management and mortgage businesses. In his last role, he was head of new initiatives with AEGON Religare Life Insurance. Roy is an alumnus of IIT Bombay and has experience across management consulting, financial services and technology. In the past, he had worked at Arthur Andersen, KPMG, Wipro, Bharti AXA, and AEGON Religare. BigDecisions.com aims to help Indian consumers make smarter financial decisions through interactive, decision-making tools. It claims to be delivering unbiased information and analysis to consumers on topics such as life and health insurance, retirement planning, child education, buying and renting real estate. The firm further claims that the platform has already helped 40,000 users make better-informed decisions. News Corp is a global, diversified media and information services company focused on creating and distributing engaging content to consumers globally. The company comprises businesses across a range of media, including news and information services, book publishing, cable network programming in Australia, digital real estate services, digital education, and pay-TV distribution in Australia. News Corp's other operations in India include Dow Jones, The Wall Street Journal, Factiva and HarperCollins Publishers businesses.